A couple of months ago I cleaned out my wardrobe of clothes that didn't fit anymore. Some things that I couldn't bear to part with went into storage, some to the recycle shop and some fabrics were set aside, destined to be upcycled into something for the kids. 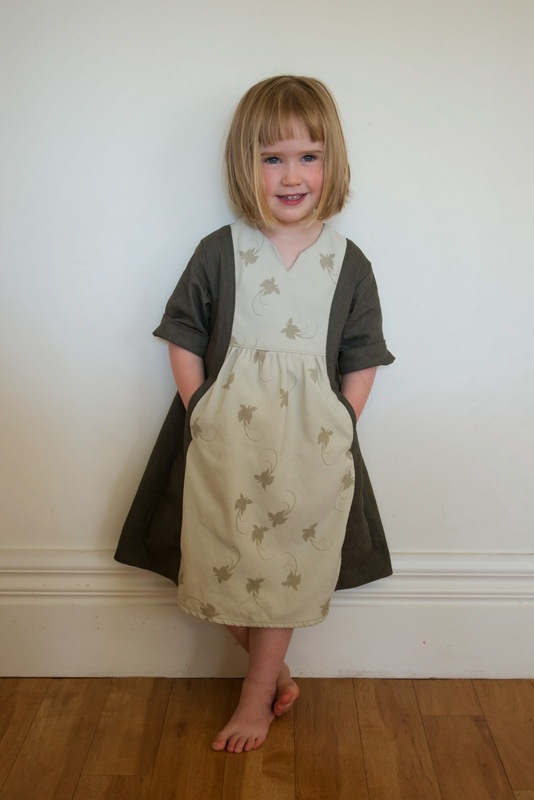 The Oliver + S Hide and Seek dress is perfect for showing off a little bit of a much loved fabric. The yoke and front skirt panel is made from an old linen/silk skirt with beigey-gold birds of paradise printed on it. 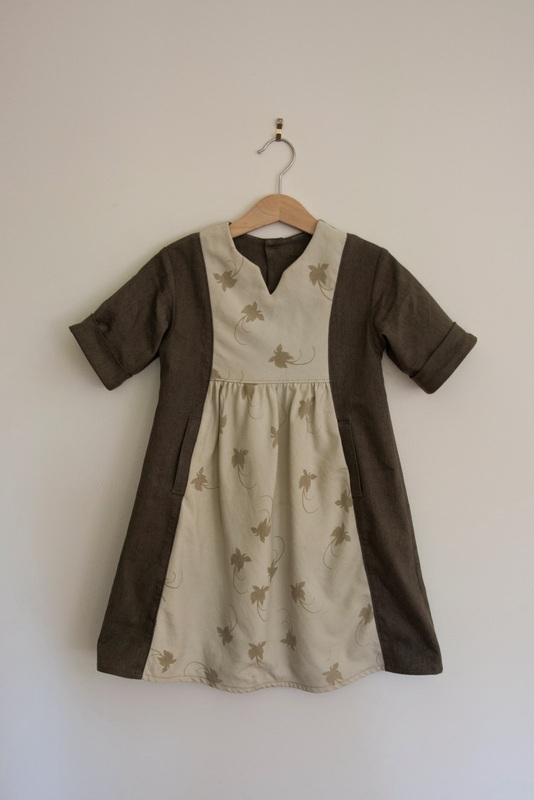 I was inspired by this beautiful version of the Cinema dress sewn by Sarvi. The Cinema dress is an adult version of the Hide and Seek dress, and given that I have that pattern (although not yet sewn) there are more opportunities for accidental, awkward matching outfits in the future! I wish I had remembered to leave out the V notch in the neckline as Sarvi did with hers. The upcycled fabric is a bit too soft to neatly hold the crisp corners that would make the V look good. Still I wanted to sew this one exactly as per the instructions since it was my first time. There will be others and I will tinker, that much is certain! 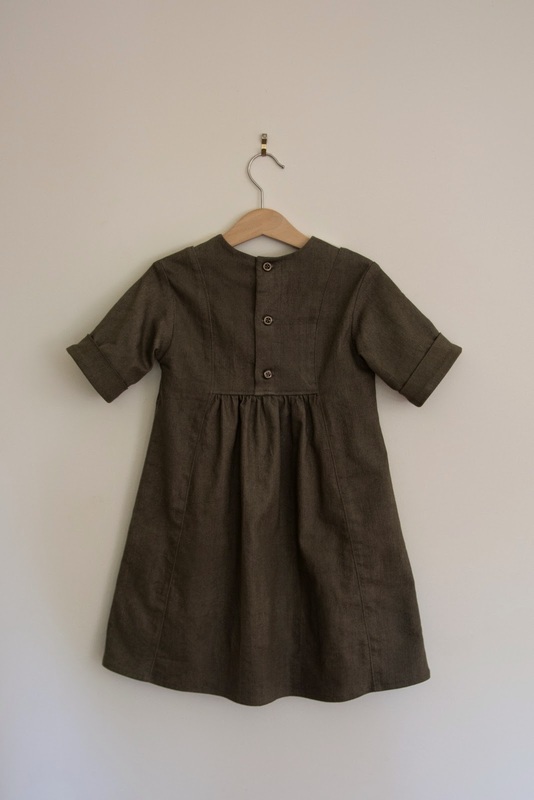 As with all the Oliver + S patterns, this is a dress pattern that seems simple but surprises with it's detail and subtle shaping. 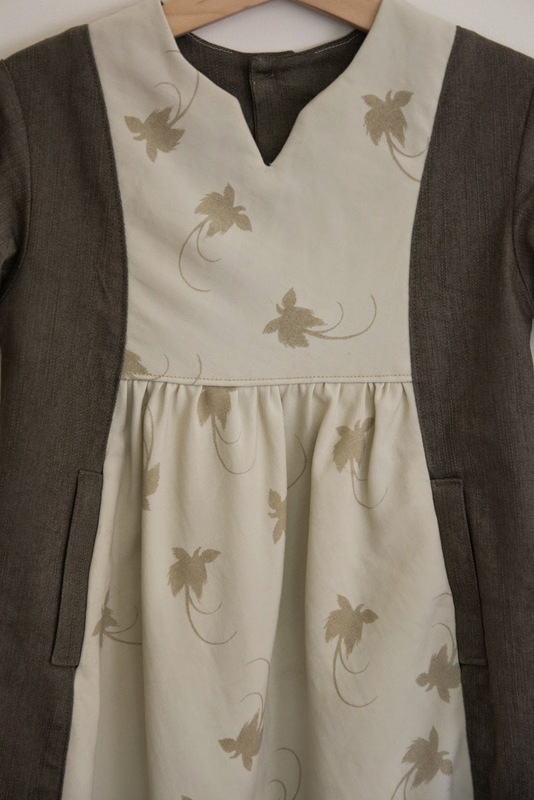 Those welt pockets are just gorgeous and the bodice and side panels create a really lovely shape. I haven't measured either of the kids for a while, but my pick of a size 3 with size 4 length seems perfect. I had taken some buttons off a cardigan my mother in law had knitted for A and replaced them with some slightly bigger ones so they didn't pop open all the time. The little buttons, of which there were three, were just perfect for this dress. But once I saw it on A, I was completely in love with it all over again. With the apron effect at the front, it puts me in mind of what Cinderella might have been wearing before the fairy godmother turned her all chintzy and over the top. Since she takes the three year old's mandate of being infuriatingly unpredictable quite seriously, she's surprised me by seeming to genuinely really like this one. I just shrug and am grateful. I love it, Shelley! Practical, yet really, really pretty! Thanks Rachel. The pattern was quite involved but I adore the shape and the details. Absolutely worth it! Oh and all the other make over movies! I can deal with bold colours just fine... but only one at a time thanks. There are some lovely shades of pink out there if you can convince Maggie that it doesn't have to be hot Barbie pink all the time. I love it, I also have 'Sarvi' admiration over many of her outfits. What a gorgeous child and that exhibition looks fabulous. I should pop Zara in a post pack. Thanks Nicole. I really wish I'd copied Sarvi's neckline, as after one wash the V has disintegrated! I'd interfaced one side on the suspicion this could happen but no idea why I didn't think to do both sides. oh well. A bit of handstitching and it should be fine. The Gaultier exhibition is superb. It's on for a few months yet if you can smuggle her interstate. Isn't this dress pattern amazing! I could make far too many. I like how you made all of the middle panels in the contrast. You (and Sarvi) have a good eye! I'll definitely be making more too Katy. I love the idea of denim with jeans style topstitching. It didn't seem worth chopping the skirt up for just the yoke part and Sarvi's dress was too good not to copy! 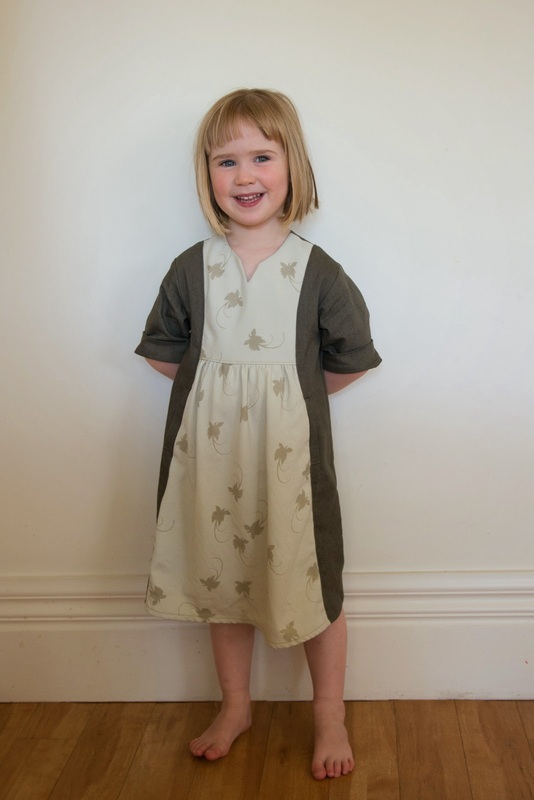 I love the fabrics you used - and this is one pattern I really want to sew. Oh, and I'm looking forward to seeing your trousers! Three year olds are full of surprises ;) Love the dress! Oh aren't they just. Seat of your pants suspense every day (eye roll)! You've done such a great job with this pattern! I adore those welt pockets as well. Love that you used upcycled fabric - yay you:) And that carousel looks beautiful - I'm sure there's a fun story there! Thanks Lucinda. 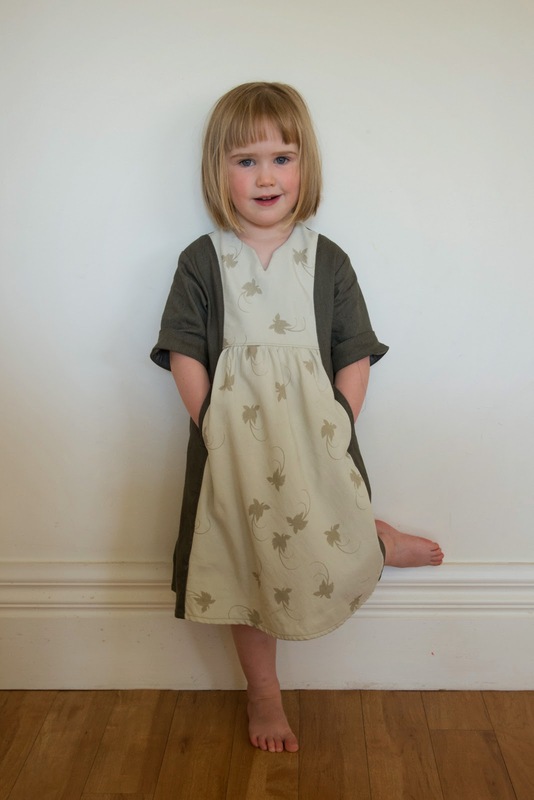 I definitely want to do a hand stitched yoke one like yours too one day. So many ideas, so little time! The carousel is stunning. It goes ever so slowly and so it's easy to hop on and off. When we arrived we were almost first at the gallery, but a couple of elderly ladies had hopped on just ahead of us. They did a few leisurely laps together, chatting all the while, then got off and continued their conversation as they wandered through the gallery. 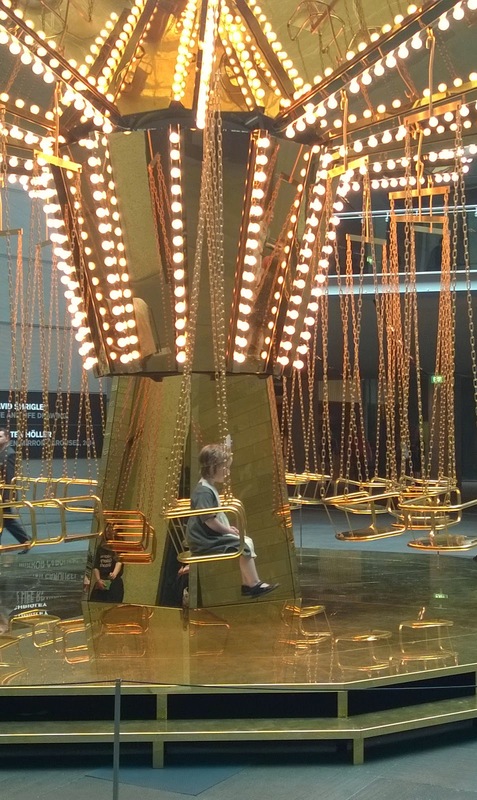 As if golden merry-go-rounds were part of their everyday routine! lucky them if it's true! !